Prime Minister meets Brazilian Christian friends of Israel. "I look forward to seeing you in Jerusalem." Prime Minister Binyamin Netanyahu and his wife Sara on Sunday met in Rio de Janeiro with Brazilian Christian friends of Israel. 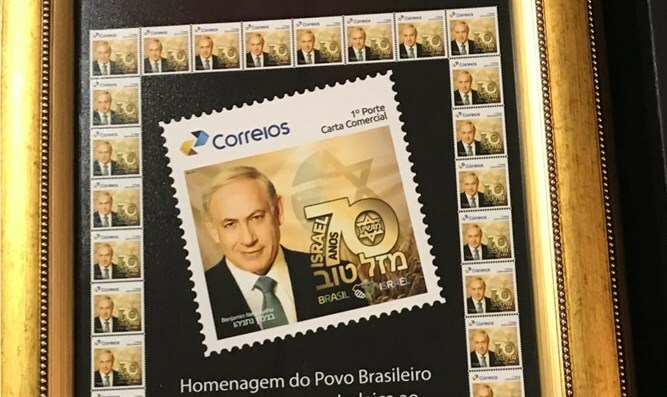 During the event the post office of the Brazilian state of Amazonas launched a stamp that had been prepared by Christian friends of Israel from Manaus in honor of 70 years of Israel's independence. "My wife Sara and I are delighted to be with you in Brazil. We have no better friends in the world than the Evangelical community, and the Evangelical community has no better friend in the world than the State of Israel,” said Netanyahu. “But this isn’t only a matter of justice, and it’s not only a matter of value. It’s a matter of the deepest sympathy in recognizing our common traditions, our common heritage,” continued Netanyahu. “So I want to invite all of you next year in Jerusalem. I want to invite all of you to come to Israel, next year, it’s only two days away. We shall welcome you with all the love and warmth that we reserve for family. You are part of our family and we are part of yours. I look forward to seeing you in Jerusalem, my brothers and my sisters," he concluded.